When sustainable-living ideas, urban gardening, bike sharing, community-supported agriculture and bike-powered machines gather together the result is the creation of a pattern that can be defined as off the grid in the sense that it does not align with the regular grid that a city, with its own pattern, imposes. 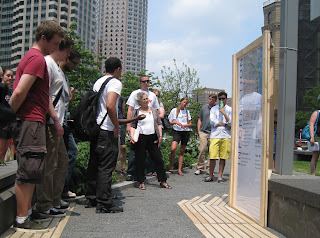 Off The Grid is also the theme that characterizes the 2012 Common Boston week, organized by a group of young and extremely talented architects at BSA. It is a wide list of creative and cultural events that is going to last for a week, starting June 15, 2012. Among them, the most engaging event is going to be the so-called Common Boston Common Build! A unique art and architectural competition that challenges participants to build and design a project in response to real community needs, in a limited amount of time: 72 hours. Participants, usually divided in teams, are invited to explore and merge the different patterns that define the relationships between the grid of the city and its "negative" (what is off the grid), working on a specific, restricted and versatile area. Merging the two patterns is going to be the challenge that will most likely lead to the creation of a new one that can be taken as an innovative and influential response to change the status quo, and considered as a new model to solve all those areas that share similar characteristics. Over the last few years the BAC has started a tradition of competing and taking home prizes. In 2009, a group of A-1 Students won the competition. In 2010 a group of B-2 students won the competition and a group of A-1 students that placed second. And in 2011, a group of designers led by 2 of the of BAC faculty won the competition and a group of B-2 students came in second. This year's competition is coming up fast, so put it in your schedules and sign up to join in the tradition! Let’s all get together and Common Build to help restore a pattern in the city of Boston and to interact and understand the built environment while creating tangible benefits for the community. The kick off is going to take place on Thursday, June 21, 2012. Don’t hesitate and be part of this community. Find out more on the Common Boston website under Special Projects.